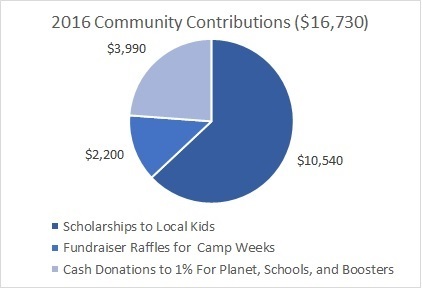 In 2016, Champion Soccer School contributed a combined $16,730 in cash donations, fundraisers using camp weeks as raffle items, and scholarships to local families in financial need. Since 2010, Champion Soccer School has been a member of 1% for the planet. 1% For The Planet has inspired members of the business community to contribute 1% of sales to environmental groups around the world. It’s about businesses recognizing that industry and ecology are inherently connected. Sustainability of the natural environment is fundamental to the sustainability of business. 1% For The Planet offers a simple, tangible and proactive way for the business community to be a part of the solution. As part of 1% for the planet, Champion donates (2010-present) to Friends of Holly Hill Farm (Cohasset, MA), an organic and sustainable farm, with education opportunities to teach both children and adults about sustainable agriculture and sound forest management. The farm has a delightful staff, and who are very eager to teach children about responsible land stewardship. If you have a free day, why not go down, take a tour, learn about responsible farming, and buy some sustainable farm products? Visit their website. Their education opportunities rely on supplemental outside funding, please consider making a donation by going to their website and inquiring about how you can support their education efforts! The Daniel Butler School is home to 3rd grade teacher and camp owner and director, Brian Bisceglia-Kane. Champion donated money to help support the construction of the new playground. Champion regularly donates camp weeks to raise money for auctions and to help those in need. Champion works with the Daniel Butler School and Wayland Youth Soccer to ensure families in need can get partial or full scholarships. Champion also donates camp spots for auction, such as the Wayland PTO backpack auction. In the aftermath of the Boston Marathon bombings, Champion was not able to run camp the last Friday of our Belmont April Break camp. Champion with the support of April break families, donated the proceeds from Friday camp to One Fund Boston in support of the victims and their families. Thanks to your help, Champion Soccer School was able to help with the recent disaster in Haiti. We donated 10 percent of our tuition received by January 31st, 2010 to the American Redcross Haiti Relief and Development Fund donating over $325.